Administrators that meet the minimum role to administer GamiPress can award or revoke any achievement or step from the user edit profile screen. Simply, scroll to the “Award an Achievement” section on the user’s profile and select the achievement type to award. On the action column you will see two actions “Award Achievement” and “Revoke Award“. Award Achievement: By clicking this action the achievement will be awarded to the user. Revoke Award: Just visible if user already has earned this achievement, by clicking this action the achievement will be revoked to the user. Automatically this action will be registered on GamiPress logs using the “Achievement Awarded” log pattern. 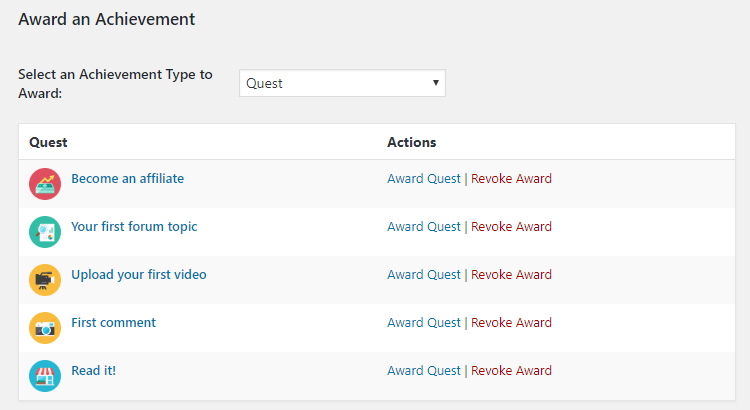 In addition, you can bulk award or revoke achievements through the bulk awards tool and bulk revokes tool.